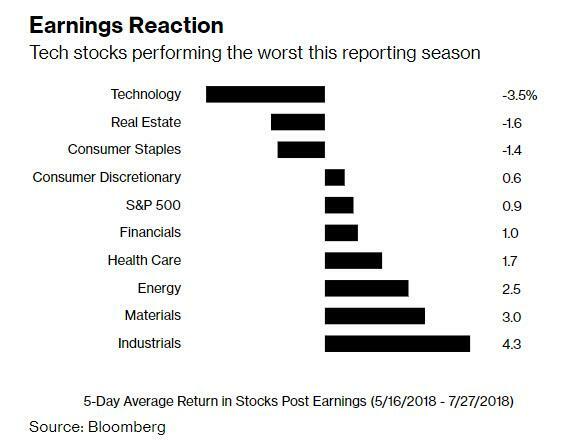 Q2 earnings season has not been kind to tech stocks: while all but one of the 36 tech firms that had reported results through this weekend exceeded analyst estimates, over the next five days their stocks were down an average 3.5%. That compares with a gain of 0.9 percent for all S&P 500 stocks, according to Bloomberg calculations. As a result, there has been a furious rotation out of growth and into value names, which as we noted earlier today saw the biggest 3-day move in the past decade, which Nomura defined as a 4.3-sigma event. And with the the bulk of "growth" names having reported, that just leaves Apple to give momentum and growth chasing traders some glimmer that the "most important trade of the past decade" is not yet over, or as Bloomberg puts it, "Apple Earnings Are Last Bet to Stop Bleeding in Tech Stocks". The flipside, of course, is that another blockbuster quarter, would bring AAPL that much closer to becoming the first trillion-dollar company, now that Amazon failed to capitalize on its strong earnings. As Bloomberg notes, AAPL shares have gained 13% since its last earnings report on May 1, when a better-than-expected revenue forecast and a $100 billion stock buyback plan calmed concern about iPhone demand. Naturally, spooked tech investors are hoping for a repeat performance as Apple closes out a rocky earnings season for the megacap FAANG bloc. Apple shares 0.8% to $191.53 at 3:30 p.m. EDT, putting the $1 trillion market cap bogey just $60 billion away. So what to expect from Apple which reports later today at 4:30pm EDT? According to RBC, unlike prior quarters when the focus was almost exclusively on iPhone sales growth, in the second quarter it will be "all about services and buybacks." RBC, which has a $210 price target on the stock, and sees 11% upside to the current stock price, notes that prevailing street expectations are driven by stable revenues, modest upside to GMs and buyback tailwinds. The Canadian bank notes that it sees "strong services momentum led by subscription growth and strong gaming (Fortnite and others) trends, partly offset by modest slowdown in Google TAC spend. While FX could be a slight headwind, AAPL's hedging program should offset it particularly when it comes to EPS & FCF." The bank is optimistic on unit sales as a result of higher iPhone promotional activity across carriers, "which should support revenues and unit sell through in the quarter." Additionally, the higher ASP dynamic should continue in Sep-qtr, given iPhone X wasn't a part of the mix last year until Dec-qtr and its pending launch impacted iPhone 8 sales last year. 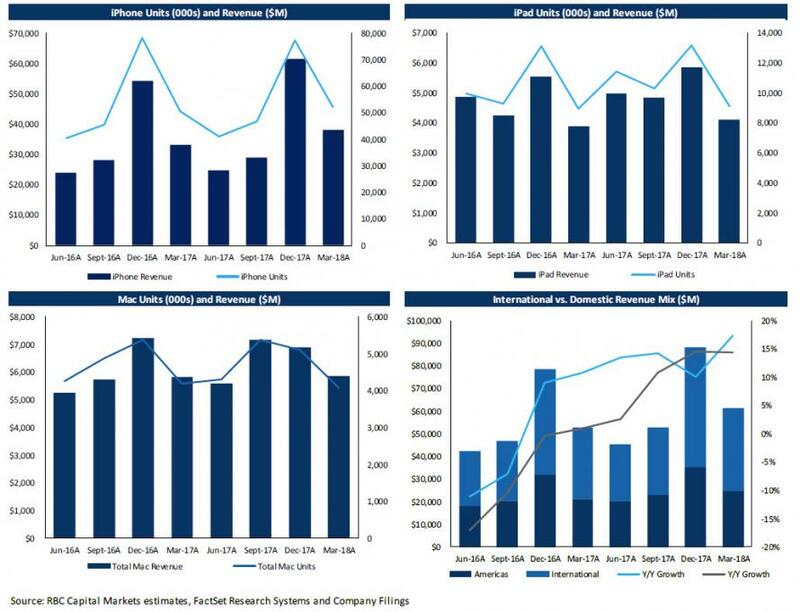 iPhone: Investors will likely focus on iPhone units, ASP, and sales mix during the quarter. Investors would also look for color on memory mix within iPhone. Capital Allocation: Investors would look for buyback cadence post AAPL's cap allocation update last qtr. China: Investors would also look for iPhone and services performance in China. Gross Margins: Puts and takes from mix changes, services growth, NAND pricing & FX impact. Services mix: Contribution of services to total revenues and any data points on revenue/profitability of Apple Music, AppStore and ApplePay. “We expect focus to be around services growth (we model 25%), gross margin performance (we model 38.1%) and expect low single-digit iPhone growth,” Mohan wrote in a note to clients on Monday. The bank estimates 47 million iPhones for the September quarter but notes that a potential later introduction of the 6.1-inch LCD model could shift some unit sales to the December quarter. “We expect Apple to report an in-line June quarter and provide a slightly weaker than consensus September quarter outlook due to a possible October launch of the 6.1-inch LCD iPhone,” Huberty said in a note last week. Investors will focus increasingly on services revenue to drive growth. Morgan Stanley estimates services grew 32 percent in the June quarter. Huberty sees the announcement of three new iPhone models in September as the next big catalyst for Apple shares. Apple has 27 buys, 18 holds and no sell ratings. The average analyst price target of $201 implies 5 percent upside over next 12 months. Mar-18: Mar-qtr revenue/EPS were above expectations driven by better than expected iPhone revenues (units slightly lower vs. Street, but ASP increase of +11% y/y), services performance (+30.5%) and others segment. Gross-margins of 38.3% were inline with guide. iPhone unit sales (52.2M) were somewhat below expectations of 53M. Overall revenues/ EPS came in at $61.1B/$2.73 vs. Street at $61.2B/$2.69. From a geographic basis, Greater China reported 21.4% y/y revenue growth, The Americas region increased 17.4% y/y, Europe grew 8.7% y/y, Asia Pacific was up 4.3% and Japan reported 21.9% y/y growth in revenue. Guidance: AAPL guided Jun-qtr to $51.5-53.5B revenue, 38.0%-38.5% gross margins (down ~20bps y/y at mid-point), $7.7-7.8B in opex, $400M in interest income and tax rate of 14.5%, implying EPS of $2.17 (Street at $51.7B/$2.12).